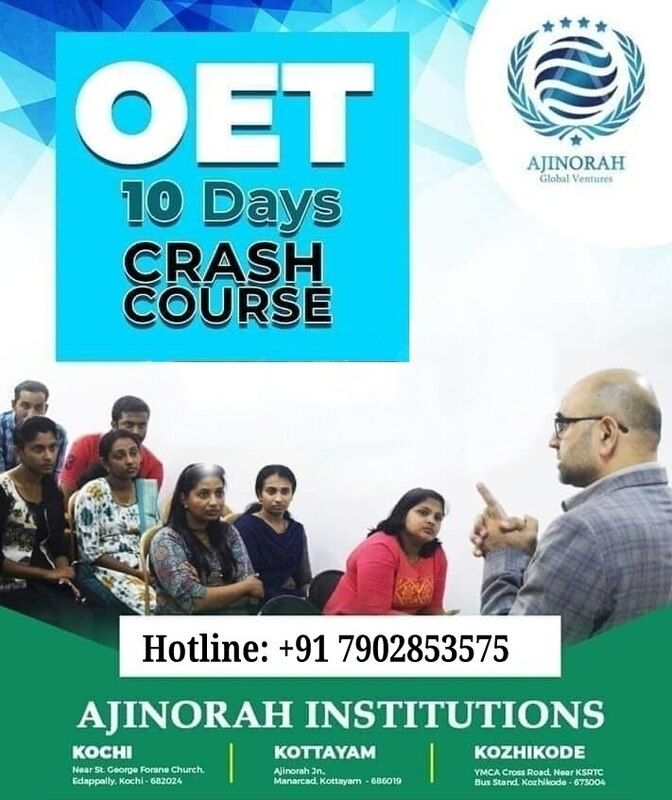 The premium coaching centre for OET and IELTS Ajinorah Institutions always impart quality training for courses like OET IELTS HAAD DHA PROMETRIC MOH BLS CRNE ACLS ECG CBT and NCLEX-RN. We are well known in the field of OET and IELTS and has a previous track record of very high percentage of success in those exams. Our expert teaching faculty, well structured course material and specially designed syllabus make it an ideal place to study OET and IELTS. We Provide 10 days OET Crash, 2 month OET regular and 60 days or 30 days OET online classes. We also offer IELTS morning, IELTS regular, IELTS evening and IELTS weekend classes.